US stocks posted their best January performance in 30 years. Following the worst December since 1931, investors can rightly breathe a sigh of relief. Our December Dashboard outlined the havoc caused by Fed Chair Jay Powell’s ill-advised remarks in October regarding future interest rate policy, as well as poorly-received follow-up statements about overall monetary policy in December. Those remarks in December touched off a four-day 1800 point slide in the Dow that culminated with the sharp sell-off on Christmas Eve. Financial markets can be very emotional from day-to-day, responding to headlines and events that may indicate a change in the financial outlook. But longer-term market trends tend to be based more on economic fundamentals and market valuations. The S&P 500 fell 20.1% from its late September peak to the bottom on December 24th, thereby crossing over from a “correction” to a “bear” market. The price earnings ratio for the S&P 500 fell from 19.2 times trailing earnings to 15.3 as of December 24th. Investors recognized a good buying opportunity, especially since the market decline was acutely noticed by the Fed and the likelihood of future monetary tightening in 2019 appeared greatly reduced. 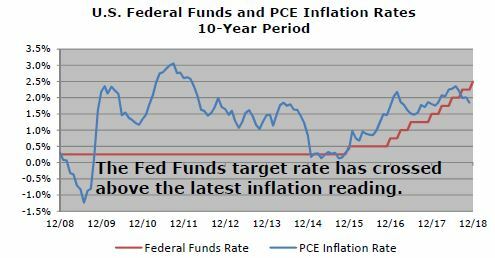 The Fed met on January 29 and 30 and Chairman Powell stated the outlook for inflation was subdued, which further confirmed that interest rates would not be increased in the foreseeable future. Stocks ended January 15% higher than the close on December 24th, and the economic expansion appears to have not been permanently damaged by the recent Fed monetary tightening. 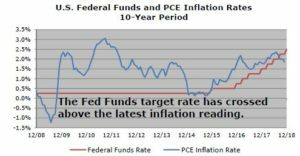 The Fed has a dual mandate to maximize employment while minimizing inflation. The current unemployment rate is 4% (up slightly from December due to strong job growth in January coupled with more people returning to the labor force) but core inflation remains under 2%. Low unemployment has been feared to cause higher inflation, which is a relic of the 1960s and 1970s era of high inflation. This link has been demonstrably broken the past 25 years. Old ideas sometimes die hard but we applaud Chairman Powell’s flexibility in pausing the rate hike cycle until there is clear evidence that higher inflation is a real threat. 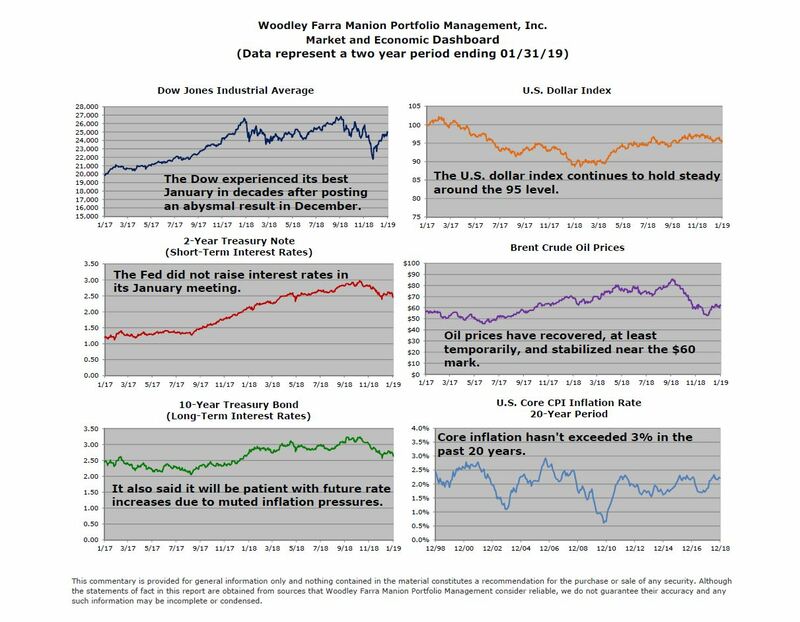 This article was posted in Dashboard and tagged economic dashboard, economy, Fed Funds rate, finance, inflation, interest rate, January 2019, Jay Powell, markets, monetary policy, stock market, stocks, unemployment. Bookmark the permalink. Follow comments with the RSS feed for this post.Post a Comment or leave a trackback: Trackback URL.